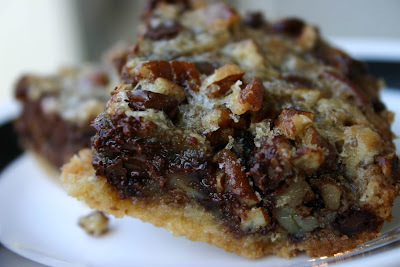 Homepage / bars / Chunky Pecan Pie Bars. I can’t believe it’s the middle of October. I can’t believe it’s the middle of October and I haven’t baked in weeks. Even after our annual trip to the apple orchards or being surprised with cans of pumpkin from my mom (come to think of it, combined with her slowly moving all the baking supplies from the pantry to the countertops, could be her not-so-subtle hint to get it together and make my pumpkin cookies before it’s Christmas). This is where I say life got in the way, but honestly, I just got burnt out on baking. Especially since the last thing I made failed so miserably. And in my defense, life did happen… my dad was in the hospital for a week, I’ve been sick and generally lazy and tired, I’m still trying to convince someone, anyone, to employ me, we ran out of baking powder (and sugar… and flour. ), Blogger was acting weird… you know. The usual stuff. But I’m back. 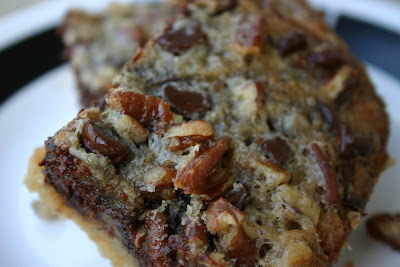 I made Brown-Eyed Baker’s chunky pecan pie bars for a recent get-together and they were a hit. I had a 300-pound bag of chocolate chips lurking in the cupboard so I used those instead of semisweet chunks. They turned out so rich and delicious that I had to cut them into bite-size pieces that mom swore tasted like fudge. Either way, they disappeared fast. For the crust, mix together the flour, butter, and brown sugar until crumbly. 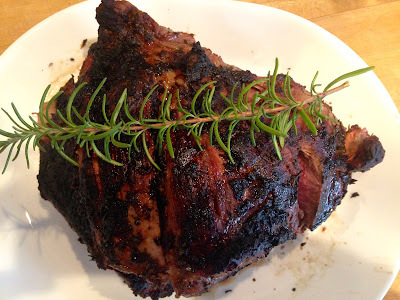 Press into the baking pan and bake for 12-15 minutes or until lightly brown. For the filling, beat the eggs, corn syrup, sugar, butter, and vanilla extract with a wire whisk. Stir in the chunks and pecans. Pour evenly over the baked crust and bake for 25-30 minutes or until set. Cool in the pan on a wire rack. Cool completely and cut into bars. Store in an airtight container at room temperature. 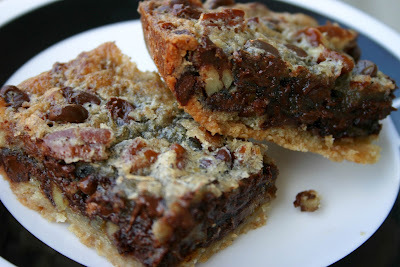 Previous post Peanut Butter Cup Brownie Bites.